Lately Sean & I have been very physically active outdoors every day of the week. We run around at our jobs, out in the hot desert sun for 6-8 hours a day. On our days off we are either rock climbing for several hours out in Joshua Tree National Park, trail-running, or hiking. At night or during bad weather, we cook and create basically a meal plan for ourselves in the RV. It's non-stop and it's wonderful. Of course, it requires a nutritious and balanced diet (and mad Tetris skills, to fit all of our fresh produce in this tiny RV fridge!). In the past few weeks, we have been making some mindful changes in food choices. Lots of experimenting with how different foods affect our energy levels, pre and post workouts, what fuels us for increased endurance, and what aids in our recovery. I've been doing quite a bit of reading and research on what foods are best for different levels of activity. From this, I have come up with a plant-based food pyramid to use as a guide for meals. We try to adhere to a food pyramid ratio with each meal, or at least overall daily intake. 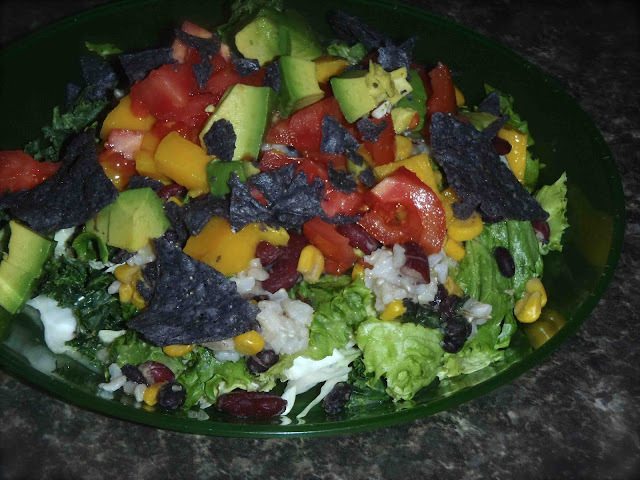 Green leaf lettuce, kale, spinach, green cabbage, brown rice, corn, black beans, kidney beans, tomato, mango, avocado, blue corn tortilla chips.